Has your child ever gotten hold of a pen and written on her clothing? 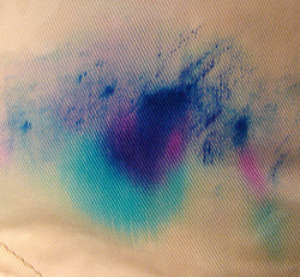 Ink stains --- oh no!!! If you are a parent this scenario has most likely happened to you. Then, you are left wondering what to do to get out that ink stain? I haven't done this myself, so I cannot vouch for it, but the pictures on her blog post sure make it look like it works. I have always tried to use rubbing alcohol to remove ink stains myself, which works pretty well, at least most of the time. Has anyone else ever tried using milk with success? Something else work for you to get out ink stains? I am always looking for more tips on how get out laundry stains. So what are some of your favorites tips?